This is the distribution cartridge used for distributing the Pokemon GBA Berry Glitch Fix Zigzagoon Distribution in stores throughout the United Kingdom. These specially made GBA cartridges were released to select stores across the UK. Players could visit these stores and connect to a GBA system containing one of these cartridges via link cable to download the patch, as well as receiving a shiny Zigzagoon holding a Liechi Berry. As with the GameCube demo discs, the program does not block fixed games, so the Zigzagoon can be received by the same cartridge multiple times. Be aware if the battery in the GBA cartridge is dead then the distribution will refuse to work. Credit: Deoxyz, InsaneNutter, Invader TAK and YoshiMoshi. These were the contributors who paid and made it possible to obtain this distribution. Save the game with at least 1 free slot in your party. Now turn off the receiving system. Turn on the sending system with the distribution cart inside, connect with a link cable to the receiving systems with the Pokemon Ruby or Sapphire game cartridge inside. Turn on the receiving system and hold start and select as you power the receiving system on, leaving the cartridge in. Press start on the sending system. The Zigzagoon will be distributed to the receiving system and can be found in your party. gatekeeper1122, King Impoleon, Invader TAK and 4 others like this. Also interesting to note that it will also distribute to French, German, Italian, and Spanish games, and even Japanese! It'll be an English Zigzagoon on the Japanese game(character limit, so named ZIGZA), but it works. Edit: I also want to note that if you're using this rom with an emulator, that you need to make sure the real-time clock setting is ON. As this setting emulates the function of a cartridge's battery, since it won't distribute to a cart with a dead battery, this setting needs to be on. King Impoleon, theSLAYER and YoshiMoshi like this. Or it actually detects whether there is a functional rtc + battery in the cartridge? My Ruby's is ded but I guess I can still use Sapphire since it works on Japanese games. If i had two flash cards i'd test that out for you UnknownRespected. Does anyone know if on the GC distribution the was the OT random? or did it depend on the game receiving the Pokemon? I noticed I have got Zigzagoon with both the OT Ruby and Saphire on my Sapphire cart. I always thought it depended on the cart for some reason. Glad to know it didn't take long to get this one! I had a feeling it'd still require a Ruby or Sapphire cart with a working battery. Plus it's the exact same multiboot as the GCN disc (with the addition of a being able to send to two more systems). Not really useful for me, then. Oh well, I'm still glad I helped with getting this ROM. I appreciate your part in this, it helped a lot. At least it's now another piece of rare pokemon data made public, to help it be historically preserved. Invader TAK and theSLAYER like this. What I find interesting (and kinda weird and worrisome) is that it prompts a "Update failure, Please look at TV screen" message if there's no save in the GBA receiving game. Was this distributed out of a GameCube? Isn't this a GBA rom? Any chance this is ripped out from GC ISO? i was not Interested to spend money into this Cartridge because i have already the ''MGDD'' No.16 for shiny zigzagoon and there is no difference between the distributed pokemon, the software has only been transferred from GC Disc to a GBA module. I was willing to help because it could have been an entirely different ROM that DIDN'T require your battery to be working. But hey, at least it's a portable way to distribute these Zigzagoon. I'm pretty certain that's the way it's supposed to be. It definitely wasn't distributed with a GameCube, we have pics of the cartridge still sealed into a GBA. Nintendo just took as little effort as possible in transferring the demo disc's software to a GBA cartridge, so it still has the same text. Since it wasn't a mass produced retail available thing, all they needed to be concerned with is if it worked properly. Regardless, I knew its function and distributed pokemon were the exact same as the disc, I just personally find GBA rom distribution superior to GCN iso distribution (assuming you don't already have the actual demo disc), and I overall wanted the rom preserved. Yeah, a lot easier to just have the rom on a flashcard or something and do the distribution, than to have to bother with really complicated GCN/GBA connection on Dolphin or having a hacked Wii/GC. I find it odd that this GBA distribution cart has the same text as the demo disc's for the Gamecube like the ''Do not unplug the GCN - GBA Link Cable...'' message. 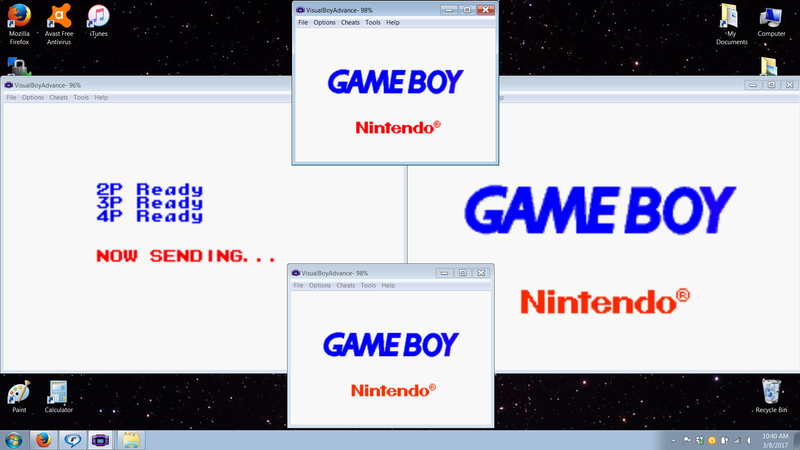 I do find having the GBA rom to be better than the GCN rip, I was just a little concerned! Well, I tried converting the ruby.tgc into a GBA rom, but no dice. Like I said above, since it wasn't a purchasable retail cartridge, they had no reason to be concerned with it being perfect. All they needed was the disc's function transferred to a cartridge. Also, this being one of the earliest Gen 3 distributions, this rom shows signs of being rough and early compared to the 10ANNIV and Aurora Ticket. I think there's more to it than that, but that's basically the bulk of what appears to have been done. There are names of Mortal Kombat characters near the end of this ROM. I wonder why those are there. Gridelin, Deoxyz and UnknownRespected like this. This appears to be the list of playable characters from Mortal Kombat Advance. Some of the spelling makes it to seem like it is part of a prototype of MKA, which would make since considering the nature of where we found this list. My theory would be this rom may have been built on top of an old MKA prototype, though I'm not quite sure why that would be the case. Interesting though. The thought crossed my mind that this rom may be from a rewritten cart, however, would remnant rom data actually be dumped as part of the rom that overwrote it? I figured it should be separate, but maybe the data just merged due to the nature of these proto/dev carts. I figured perhaps Nintendo modified a MKA rom into this distro rom, but like I said earlier, I'm not sure why this would be the case since that doesn't make much since. Because I'm not sure why they just wouldn't start fresh with this rom build, versus cutting down an already existing rom. At the same time, I'm not sure if it's GameFreak who put together these distro roms, or something made by Nintendo themselves. It'd be even more weird if it were GameFreak. Regardless of all of that, I think there's a good chance these proto/dev carts were just reused when the old rom wasn't needed anymore. If the roms are placed on them by Nintendo, then that easily makes since. Even if it was GameFreak, Nintendo probably just shipped them some pre-used carts to use. They don't necessarily have to have been blank when the rom was placed onto it. I think it makes more since that way, because rewritability is the big feature of these carts. And it would naturally save production costs if they reused them with different projects, with some of them being sent around between Nintendo and developer companies where some may be needed. I think this is the likely case with our situation, if remnant rom data did indeed merge to this rom by being rewritten. If they built the rom on top a MKA proto rom, I don't understand that reasoning. Please note the download has been replaced on 16.03.17 with a correct sized re-dump of the distribution, the previous dump was over dumped. I would recommend you re-download and update your own personal archives. I want to ask for clarification, because I might be and most likely am doing something wrong. I have done both the Aurora ticket and aura mew and figured I might aswell get this event on my Pokémon Ruby, has a replaced battery, because it is a good way to get the Liechi berry, but unlike the other two events when I put this onto a microsd for my ezFlash IV the only message I get is this. Any trouble shooting I might be missing? Any advice is greatly appreciated.